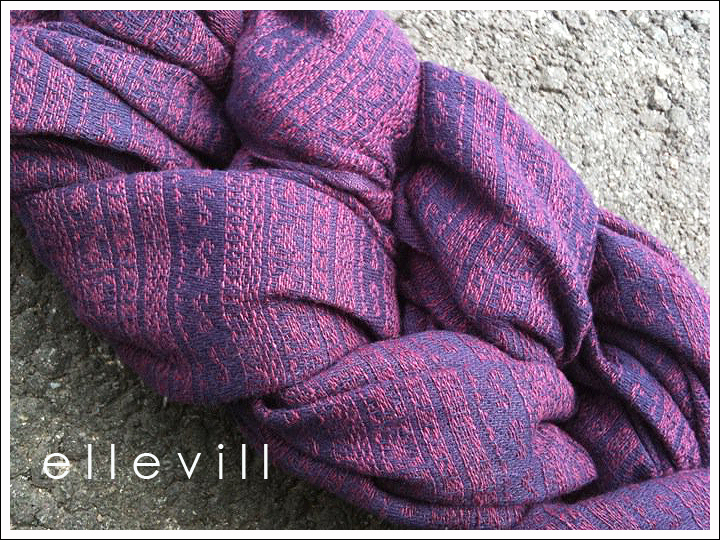 The Ellevill Jade woven wrap is a beautiful Norwegian designed wrap that is 100% cotton and woven in India. We offer the Ellevill wrap in several great colours and is a very supportive wrap for both babies & toddlers, with no presure points for adult or child despite being a lovely thin wrap. It is cut with tapered ends & leaves a very small knot & softens very quickly from new. 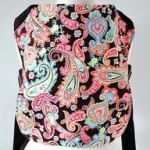 If an Ellevill sling you are after is not in stock, please contact us as we can order them in for you. The jacquard woven pattern on the Ellevill wraps is inspired by old Norwegian knitting designs and clothes/rugs from South America. 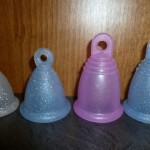 Ellevill Jade wraps are designed by Ellevill and produced in India under strict international ISO requirements. PLEASE NOTE- All wraps are now machine woven, not hand woven. But that does not mean that they will be perfect and flawless, only fewer and less flaws. The wraps are not woven by auto looms. 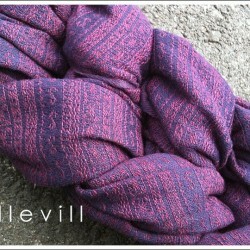 Ellevill believes in the old traditions of weaving. The small machine looms that are used in the production of Ellevill wraps are still run by the hand of humans and can therefore not be perfect. This is art and uniqueness, not flaws as many people think. This is a big difference. Any minor imperfections that may exist, WILL NOT affect the safety, comfort or durability of the Ellevill wrap in any way! Due to the Jade wraps being made of 100% cotton, it is possible it may shrink up to 5% during a wash – which is why the wrap is designed slightly longer to compensate for any shrinkage, ironing the wrap after a wash helps stretch the fibres back to the original size. Please note if the colour or size is not available, please contact us on Sales @ Naturallyhappyslings.co.uk as we maybe able to order in the desired Ellevill woven wrap specially for you. Naturally Happy Slings is the UK distributor for the Ellevill wrap within the UK, if you wish to sell this wraps on your site or in store please contact us for reseller pricing.